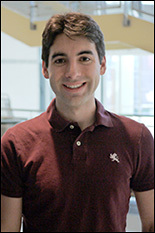 BioE graduate student Eric Hoppmann. Fischell Department of Bioengineering (BioE) graduate student Eric Hoppmann, advised by Assistant Professor Ian White (BioE and Institute for Systems Research), won the “Pushing the Boundaries of Science” division at the University of Maryland's 2013 Graduate Research and Interaction Day (GRID). Hoppmann's first place oral presentation, "Paper-Based Dipsticks for SERS Detection of Genetic Targets," described how the White Group's ongoing work on paper-based sensors can be used to perform low-cost genetic-based testing for infectious disease. Conventional diagnostic techniques, Hoppmann explains, are slow and expensive, limiting their implementation to wealthy countries with specialized lab facilities. "Genetic testing is often the only way to directly diagnose a large proportion of these diseases in hours instead of days or weeks," he says, so genetic-based diagnostic systems capable of testing for disease at the point-of-sample, such as a local clinic or even in the field, would not only benefit developing countries, but also reduce the time required to obtain results. Polymerase chain reactions (PCR) can be used on a sample to multiply a fragment of DNA from a target disease into a quantity large enough to be detected via fluorescence imaging and reported as a positive test result. It's a highly sensitive technique, but only one to a few tests can be performed per reaction, and it requires expensive optical equipment. Hoppmann and his colleagues have developed a novel paper device that can be used to evaluate the results of more PCR reactions at a lower cost. "We have developed a dipstick that leverages the intrinsic wicking and separation properties of paper to distinguish targets in a PCR reaction," he says. "Positive samples are concentrated into a special, inkjet-printed region on the dipstick where the simultaneous detection of a large number of targets can be performed using a simple diode laser and low-cost spectrometer." Hoppmann has also used the paper-based sensor technology to found a startup company, Diagnostic anSERS, with fellow group member Sean Virgile. The young company's products are produced and function in a similar fashion, and can be used for more portable or on-demand surface-enhanced Raman spectroscopy (SERS). SERS, a molecular fingerprinting technique, is used to detect trace amounts of explosives, drugs, toxins or other target substances. GRID, run by the Graduate Student Government, is a campus-wide event in which graduate students from all parts of the university present and discuss their work with faculty and fellow students, enabling them to receive feedback from a broader audience and perfect their conference presentation skills. Participants make oral and poster presentations that are judged in a variety of categories by faculty, postdoctoral fellows, administrators, and other specialists from around campus.